Video Marketing – WebAtude – Internet Marketing Done Right! WebAtude knows that the definition of video marketing is having a campaign strategy with content designed to increase audience engagement through social activity around a given video. This proven tactic draws in traffic and new customers for businesses large and small. WebAtude knows the ins and outs of video marketing which finds roughly 90 % of global consumers as they watch online video content. Here at WebAtude we understand that video marketing is the fastest growing online format for promoting products and services as well as providing entertainment for all age groups. Our WebAtude team provides video marketing techniques and methods that attract new clients and customers to engage them, build relationships, give product information, and increase sales. Video marketing must be cutting edge as it has taken over the written word and is now considered to be the most accepted form of communication. It is the way to communicate important messages and share information with new prospects and customers, being the fastest growing area on the web today, and we can get the satisfaction that you are looking for with WebAtude. We know that people pay attention to video which allows viewers to go directly to the source. It proves to be pure entertainment for any level of imagination and can influence the way one thinks and feels about a product they are viewing or a service they are considering. 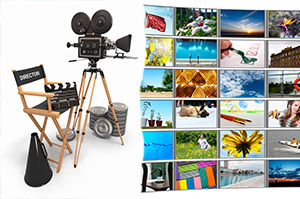 At WebAtude, video is fast becoming a critical form of content for consumers as well as buyers. The rise of video marketing has created an abundance of information available at one time, making the need for short, well-scripted and relevant video with quality content all the more critical. Our Internet video services should be a significant part of your marketing strategy because of our years of knowledge of the industry, along with the many benefits they provide. At WebAtude, we show you the way to tell your story through video and provide you with the right information, being the key part of any marketer’s techniques, to help you deliver the message you want to share.